Today we had the privilege to worship at one of our supporting churches, Harvest Community Church in Selah, Washington. It was a pretty special morning as we had time to share during the services, but more importantly, to hear from some of the people about how God has been working in their lives this past year. As a church they took some time today to have an open microphone where they could share and we heard incredible testimonies of God’s goodness. One testimony was from a lady who talked about how her brother who was born deaf was able to hear for the first time in his life at age 53 because of medical advances and a surgery he was able to get. Another was from a young man who talked about a friend of his who was contemplating suicide. By God’s grace, the friend called this young man and he was able to talk him out of it and he asked for prayer for his friend to come to Christ. That young man knows what his friend truly needs, a relationship with the One who can save his soul. Along with the blessing of being at church, we had the chance to video chat with close friends of ours who live in California. Since we’re on the same time zone right now, it made connecting with them a lot easier. It was a sweet time just catching up and seeing each other’s kids. It meant so much just to spend time chatting about life, even though it was over video. I’m thankful for the friendships God has provided us and the technology to keep up with them, even if it’s from a distance. 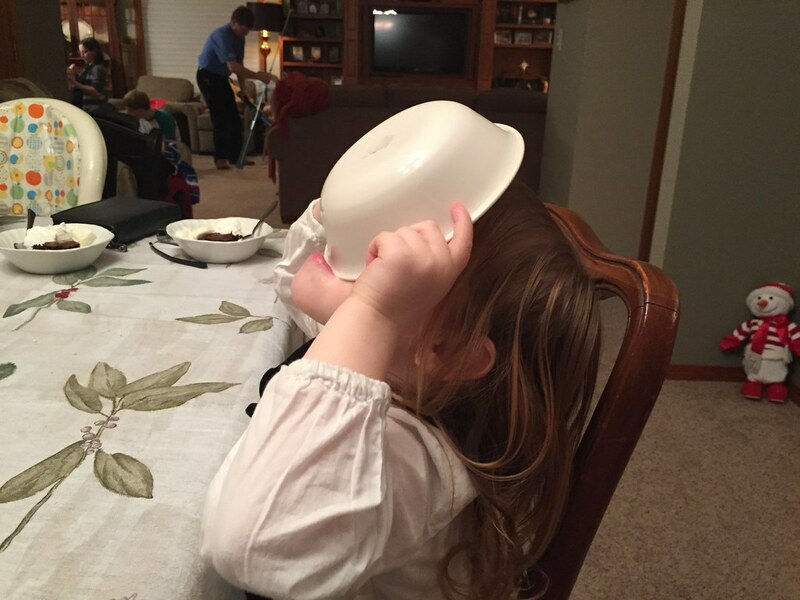 I got the above photo tonight of Avery trying to get every last drop of her ice cream dessert out of her bowl. After she tried this for a few minutes she said to me, “Daddy, can you help me?” Somehow she wanted me to scrape more out of the bottom of the bowl for her. I did my best and she was happy. It was a cute moment. We watched more home videos of Bethany and her family tonight and it was a lot of fun. Our kids love watching one in particular of Bethany when she was about 3 years old sledding in their front yard. I’m glad our kids get to see the footage of Bethany as a kid. But it’s also a reminder to me to make memories for our kids. As I watch Bethany’s family react and talk about what’s on the screen, I’m challenged to think about how I can lead my family and make sure we’re just enjoying life together. It’s so easy to get caught up in the work of ministry or even pursuing language learning that I can forget to take time for us to enjoy family and make memories. By God’s grace, we’ll make sweet memories together in the years ahead and one day we can look back and enjoy talking about them (or watching them!) together.